Model: Kim, height 1.80m wears size M. If your bust and waist are in 2 different sizes, make sure you are ordering the largest size, as the dress is 100% coton with no stretch. SALE! 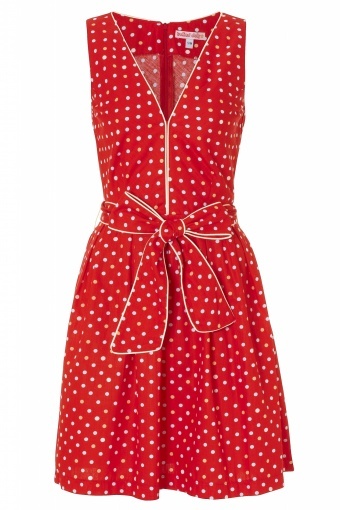 The 50s Candy Girl Red Multicoloured polka dress white trim from Trollied Dolly. A true 'dolly dazzler' of a dress in the form of this fabulous 50's inspired Prom style frock! 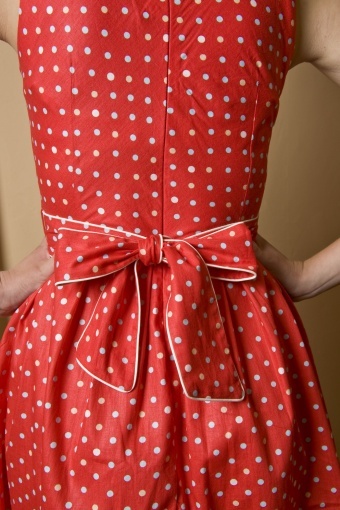 A timeless and feminine silloutette in a punchy red polka with ice cream coloured dots, equals a modern day, easy to wear version of American 'Petticoats and Ponytails' styling. This show stopping beauty ticks all the right boxes... A neat, petite fitted top shows off your best assets and the pretty bow feature belt adds definition. The flat pleated skirt gives you all the hourglass 'fullness' required with none of the big-bummed bulk! (what more could a girl ask for?). Pictures by Sjurlie Photography.